WASHINGTON -- US President Donald Trump on Monday named additional members of a delegation to the opening ceremony of the PyeongChang Paralympic Games. 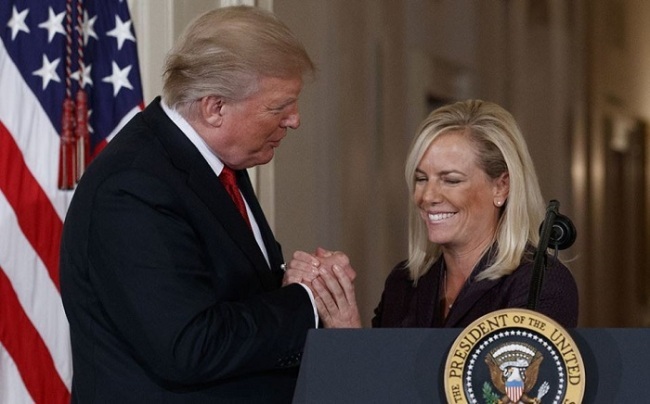 The designations come after he chose Secretary of Homeland Security Kirstjen Nielsen to lead the group to the event this Friday. The other members are Marcia Lee Kelly, deputy assistant to Trump; Marc Knapper, charge d'affaires at the US Embassy in Seoul; John Bardis, assistant secretary for administration at the Department of Health and Human Services; Gen. Vincent Brooks, commander of US Forces Korea; and Paralympic swimming gold medalist Staff Sgt. Elizabeth Marks, the White House said in a release. Kelly is a Korean-American who worked as director of operations for the Republican National Convention during Trump's 2016 presidential campaign. She was the first woman and first Asian-American to serve in the role. Kelly told Yonhap at the time that she met Trump at an event in New York she helped organize. The Paralympics are set to run through March 18 in the same alpine town the Winter Olympics took place Feb. 9-25.